Hardcover with jacket, 320 pages, 13.5 x 21.5 cm, 5.3 x 8.5 in. It is the night before the village festival in Fürstenfelde. The village is still asleep. Except for the ferryman – he is dead. And Mrs. Kranz, the night-blind painter who wants to capture her village by night for the first time. A bell ringer and his apprentice want to ring the bells. The only problem is, the bells have disappeared. A vixen is looking for eggs for her young, and Mr. Schramm, who used to be a colonel, cannot decide whether to go and get some cigarettes or shoot himself in the head. They all have a mission. They all want to complete a task before the night is over. None of them will admit to having observed the break-in in the village archive. The door of the building is still open. But it is not what has been stolen that is distressing those awake but what has escaped: old stories and memories, myths and fairy tales have broken out and are creeping with the people round the houses. They all add up to make a novel about a long night, a mosaic of village life in which long-time residents and newcomers, the dead and the living, artisans, pensioners and unemployed demigods in soccer shirts all meet up. "A village in the Uckermark, fully in the present, yet rife with legends. 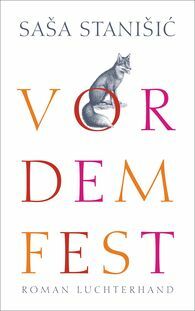 In Before the Festival, this village tells its own story – a novel as a compelling multi-voiced chorale put in prose."